I am the squirrel lady. Well, I feel that way anyway… I have accumulated orphan, baby squirrels. Three to be exact. “Hey J” (originally named “AJ” but the kids like “Hey J” better) is our oldest. He is about 13 weeks old. I’ve had him about 8 weeks now. I received him from a friend who’d found him outside her house and didn’t have the time to devote to him. I got the other two (Lavern and Shirley) from a friend whose husband cut down a tree with their nest attached. Knowing that I used to rehabilitate my friend called me asking if I would take them. 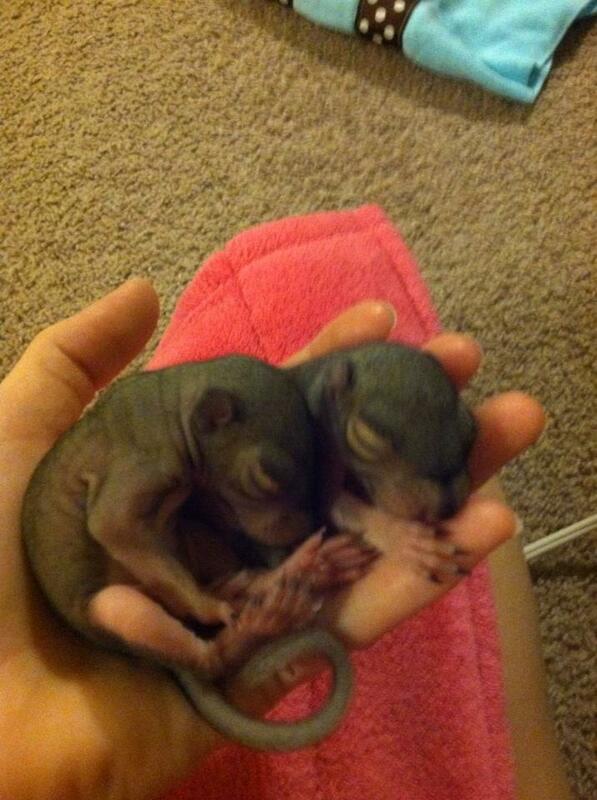 So here I am with baby squirrels. So, I officially have 6 children. Squirrels eat about every 3-4 hours. 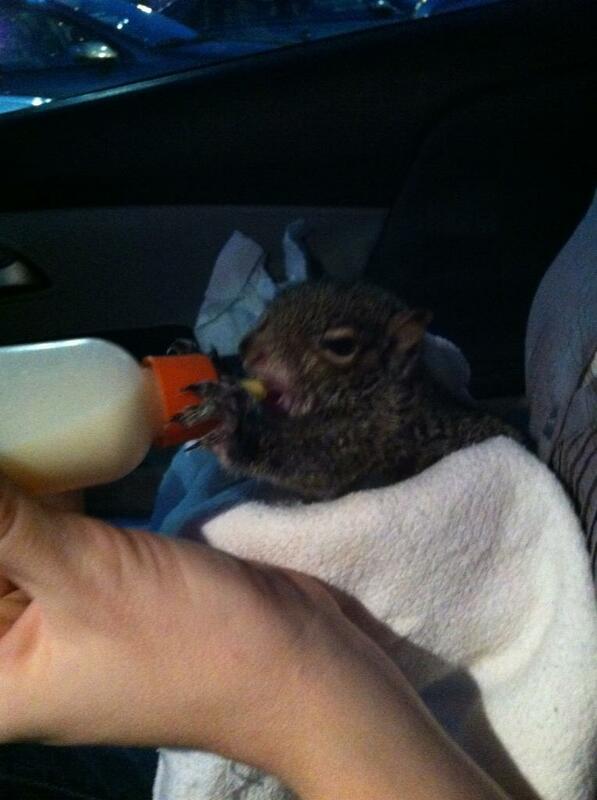 If I’m not nursing a baby or feeding toddlers, I’m hand feeding milk to squirrels. Sigh. It’s a tiring job, but very fun 🙂 Today was the day that Hey J officially got to be “let go”. 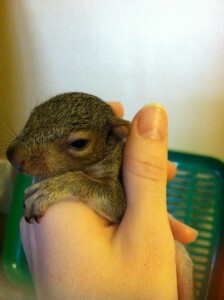 There comes a time in every squirrel’s life that you open the cage door and allow them to run free and be a squirrel. In theory this sounds wonderful, but to Hey J it wasn’t all that great. You see, he doesn’t know he’s a squirrel. I think he thinks he is a person. The first time I saw a leaf he was amazed with it and kept smelling it and pawing it on the ground. When I tried to set him on a tree in the front yard he climbed for a second, came right back down, ran up the porch then into the house. It took much persuasion but he is now frollicing in the woods behind the house. Well, climbing up and down 3 or 4 particular trees. He won’t go far. But it is nice looking out my kitchen window and seeing him. However, I have to admit, I am worried about him. He’s become a part of the family and watching him grow and now releasing him is bitter sweet. He deserves a wonderful squirrel life full of jumps and climbs and acorns, but I am concerned about dogs, cars, other squirrels, people who may get too close and him climbing up their leg to sit on their shoulder… I guess I have to just accept that it’s time for him to be free. My mom said to me today, “Honey, you have to give him to God.” I’ve prayed more for that dumb squirrel in the last two days…. To think, I get to go through this 2 more times with Lavern and Shirley. And one day I get to go through it with actual human beings. Joy Joy!